Not much to report from the Vanquish today. I may be grossly mistaken but I think the Oakcliff All-American Offshore Team has relocated somewhere near the equator and we’re stuck in the doldrums. 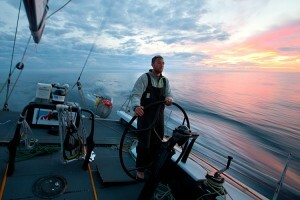 We spent most of today virtually motionless, which is not the way we saw a transatlantic race coming to an end. Our three-day “training” session before the July 3 start was considerably windier than anything we encountered these past ten days and, in reality, the lightwind Block Island Race earlier this spring was more relevant from a preparatory perspective. It is not to say we aren’t making the most of our drifting hours. Jesse braved the North Atlantic waters for a cold shower. Many have taken to rapping. I’ve been giving camera lessons. Matt has watched each of the movies on his iPod several times, it seems. In a move of utter desperation, Chris finally removed the “Paint” app from the nav station pc’s as they were proving to be too much of a distraction for the rest of us. For the on-deck watch there’s not much to do but keep tabs on Beau Geste and Sojana to the southwest (9 miles and 14 miles, respectively). We’ve been going toe-to-toe with Beau Geste these last few days and we led the way east for most of yesterday, only to wake this morning and see them parallel to the south. Today we’ve again worked hard to go fast forward and we enter the night in the leading role. We will see what the next 10 hours bring. Nonetheless, it’s nice to know there are others suffering the tropic conditions out here at latitude 51 north. At this point nobody really knows how long we’ll be out here. Most of us have already missed flights or had to change plans, but so is life and I know there’s nowhere else I’d rather be “stuck” than on this boat, in this ocean, with the AAOT. The stars are out, it’s a full moon, and there’s not a ripple on the water. Life is good! Do it again: In a heartbeat. Do it again: Absolutely, I’d be disappointed if I didn’t. Do it again: Hands down. Worst memory so far: Groundhog Day – sailing into the same ridge of high pressure three days in a row. Best memory so far: Pushing as hard three days into the light stuff as we did in the heavy air! Do it again: You bet. Worst memory so far: Doing 0. Best memory so far: Doing 20.